I have declared my interest in contesting in the upcoming General Elections in the Parliamentary seat of Limbang P221. It is my vision to see great improvement and a moving forward for the people of this area, and I am sure I am not alone in my aspirations. Therefore I wish to invite all the people of Limbang and the surrounding areas who share my vision to come forward to assist us in our outreach to the community. We need as many volunteers as possible to help us with various activities, ranging from registering new voters to distributing materials in the more remote areas, starting immediately. Please call Patricia Jack on 019-4872231 or Lynette Tan on 012-6636630 to confirm your attendance, or email lynettetanping@gmail.com by 4 March 2012. Kindly let us have your name, contact number and email address. I am looking forward to sharing my vision for a better Sarawak with all of you. Sarawak Report revealed on 25 February that the MP for Baram, Jacob Dungau Sagan, his wife and daughter are the secret holders of three timber concessions in Sagan’s parliamentary constituency of Baram. 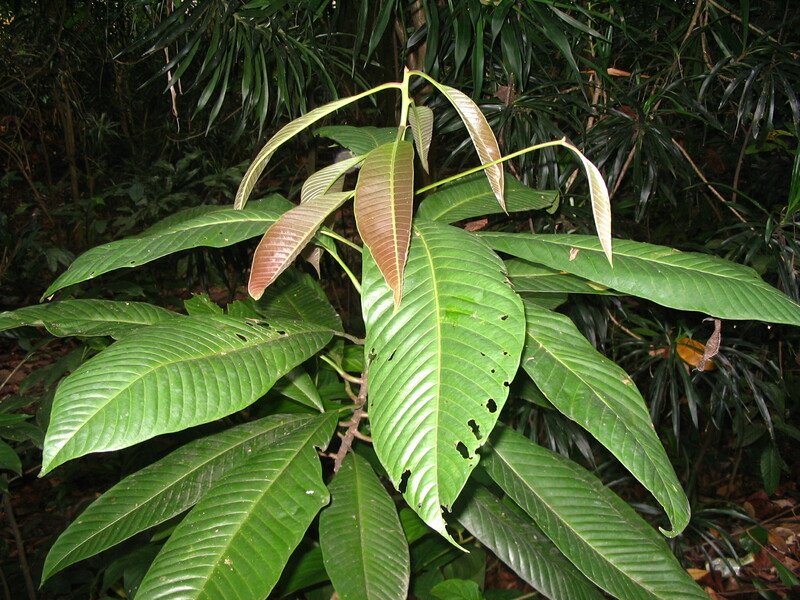 Sagan’s concessions, with an estimated worth of several million dollars, are specifically licensed to harvest Belian (Borneo ironwood), a particularly rare and sought-after South-East Asian tree species. Belian has been classified by IUCN, the International Union for the Conservation of Nature, as a vulnerable species and is banned for export from Sarawak and from Indonesia. Today, Sarawak Report revealed that Sagan’s family company held by his wife, brother and sister-in-law (believed to be his proxies), Dema Tega Sdn Bhd has received RM63 mil in public contracts over the last 5 years, including a contract for a rural water supply system funded by the federal government and commissioned by the Sarawak Public Works Department. It is true that I have no confidence – I have no confidence in the BN government, whose members are only interested in lining their own pockets. On the other hand I have full confidence in the people of Sarawak to make a proper judgment of what is right even in this particular case. It is now also crystal clear why Sagan has to throw his support for the construction of the dreaded Baram dam, which is set to drown 26 villages in his constituency, including his birthplace, Long Anap. It is estimated that the construction of the Baram dam will force the displacement of 20,000 indigenous people in Upper Baram. Saving the homes and livelihood of these villagers is low on his priority list. By accepting the Belian concessions, he has put himself in a position where there is an obviously insurmountable conflict of interest, and where he cannot effectively perform his duties as an elected Member of Parliament. He has lost all legitimacy to continue as a Member of Parliament representing the people of Baram. The price of riches is high, and for him, the cost will be his self-respect and the respect of his constituency, and indeed, of the people of Malaysia. He should (unlike Sharizat) resign from his position if he has any shred of honour left in him in the light of these revelations. PKR calls on the MACC to investigate this shocking abuse of power and breach of trust by a Federal Deputy Minister. We demand to know how and why Sagan was given the timber concessions and the lucrative contracts. Recognising, as the government does, that the giving of a bribe is also a crime, the MACC should also investigate the source of the giving of these very licences to Sagan a serving MP and determine whether indeed there has been a breach of the laws. When a river and a boat is your only practical means of transportation, getting basic medical care can be a challenge. CATHERINE Laleng kept wetting down her six-month-old baby’s feverish body with towels. But nothing she did could lower Clarence’s temperature. She was living every new parent’s nightmare: watching helplessly as her child suffered. At the time, Laleng was living in Long Tungan in Ulu Baram, one of the most remote areas of Sarawak’s interior. The nearest health clinic was in Lio Matoh, which was accessible by river. A villager had a boat ready to take the distraught mother and her child to the clinic but the water was too shallow due to a dry spell. It was two days later before they could make the journey. “The medical assistant on duty scolded me for not bringing my baby in immediately; I didn’t know how to make him understand that there was no way I could come earlier,” recalls Laleng, 40, in her current longhouse in Sungai Dua in Baram. “Clarence still couldn’t stand when he was two. I knew something was terribly wrong with him then. His body was limp and feeble. He didn’t crawl around like other children and would just lie still on the floor all the time. That was 18 years ago. Today, Clarence is a young man with bright eyes that stare at strangers curiously but without comprehension. His left side is paralysed and his mother cares for all his needs, including bathing him and attending to toilet calls. “He is a good son and helps me whenever he can with things like throwing out the garbage. He is always in good spirits and seems to understand me. The schools refuse to accept him. And I can’t read or write, so I don’t know how to teach him at home. “It breaks my heart to think of the life he could have had if he hadn’t been sick, or if I could have got him medical care earlier. There is not a day that goes by that I do not feel grief and regret,” says Laleng. People in cities and towns – and even in small villages in the peninsula – take for granted basic healthcare that is still desperately lacking among remote riverine communities in Sarawak’s interior where travel is mainly by boat along Sungai Baram and its tributaries, and that means journeys depend on prevailing weather conditions. Catherine Laleng and her husband still grieve for the lost future of their son Clarence. At Long Lamai, the most remote Penan village in Ulu (or Upper) Baram, the 500-odd villagers rely on rickety boats powered by diesel engines to get them to the nearest clinic in Long Banga, which is serviced by twice-weekly flights to Miri. The boat trip takes nearly two hours across rapids and even whirlpools during the wet season. Along some stretches, passengers must disembark and walk along the riverbank while the boats manoeuvre between large boulders in the water. And if there are no flights at Long Banga, access to Miri requires strenuous eight-hour journeys on bumpy logging roads. 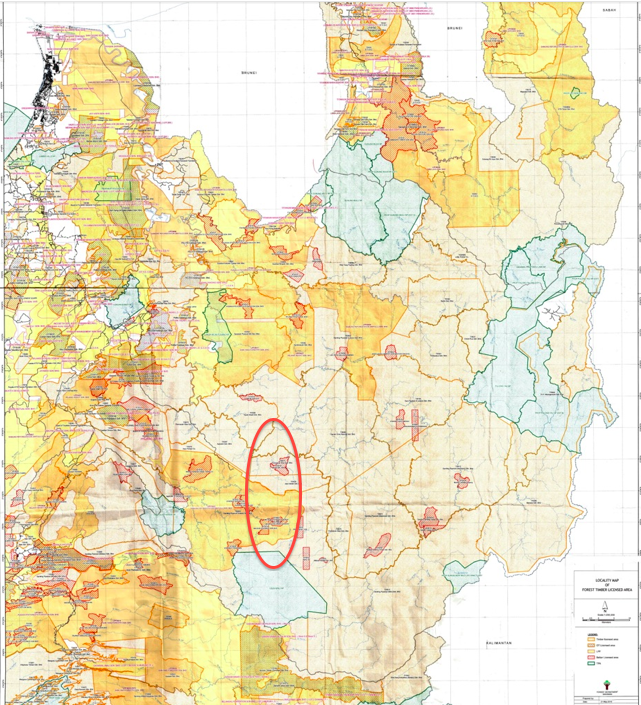 Little red dots on a map provided by the Health Ministry indicate the availability of health clinics scattered around the Marudi district in which Baram is located (see page 5). They appear sufficient, with 30 government clinics serving a population of 60,000. Yet villagers still struggle to gain access, especially when they are ill.
Mud-splattered trucks and 4WD vehicles constantly pull in for a break at Lapuk, a dusty town between Miri and Long Laput that serves primarily workers from the logging camps or massive palm oil plantations in the area. Only these vehicles can survive the punishing terrain. The seriously ill, or pregnant women in their first trimester, cannot make the four-hour journey to Miri even in these sturdy vehicles because the unlighted, untarred trunk roads are among Malaysia’s worst, providing a bone-rattling ride that jolts passengers against the vehicle’s doors and even roof. When it rains, the roads become a dangerous quagmire of slippery mud. While the old, the ill and the infirm find accessibility a challenge even in major cities, it is far worse for riverine folk living in such remote areas. Few villages have proper jetties; notched tree trunks are the only way down slippery, muddy banks to boats in the water. As she grows older and more infirm, Puyang Urang worries about the future of her son, Dominic Jok, 38, who is developmentally challenged. In the Kayan village of Long Laput, Ajang Wan awaits death on a mattress in the corner of a room in his longhouse. At 98, he is the oldest resident in the village, which is surrounded by hectares of palm oil plantations. His daughter, Lahong Ajang, 60, explains that he has been ill and paralysed for months and is now blinded by glaucoma. “He can’t sit up any more. I hope there are no complications because I don’t know how we can get him down to the boat to take him to the nearest clinic in Long Lama,” she says. It takes about 20 minutes to get from Long Laput to Long Lama by boat but nearly two hours by road. Her husband, Fletcher Siner, 67, a medical assistant in Long Laput in Middle Baram in the 1970s, explains that the clinic in Long Lama serves a few villages but is inadequately equipped and manned only by medical assistants who cannot do much beyond providing first aid or treatment for cuts, wounds, sore eyes, diarrhoea or vomiting. A new hospital will be built nearby (near Long Laput) to serve the Baram district, which sounds like a solution – until Sungai Dua headman Jacob Lawai explains that this location is also difficult to access. “I don’t understand how the new facility was planned. These are riverine villages and our primary transportation is by boat. But the new facility has been shifted to the opposite riverbank so it is even more difficult to access. At the Long Laput Community Rehabilitation Centre, ‘slow learners’ are taught skills such as weaving baskets from strips of old newspaper. “What we desperately need is a doctor stationed here (centrally located in Middle Baram). There have been cases where people died due to delayed medical assistance. Many people suffer from prolonged gastric problems and fever but these are deemed not serious enough to make that difficult trip to Miri so they just live with it. While Telang Usan assemblyman Dennis Ngau Jok says he does wish there were more clinics to serve the people, he points out that it is challenging to meet their needs due to the distance between each village. Every morning at the Pusat Pemulihan Komuniti (community rehabilitation centre) in Long Laput, children are busy learning to twist strips of newspapers into baskets. The centre teaches people with disabilities, or orang kurang upaya(OKU), skills like basketry, beading and sewing. This is the first centre in Sarawak to be located outside a town or city and to cater to the surrounding villages. Jacob Lawai says authorities should consult users of healthcare facilities before planning where to site them. However, without proper medical diagnoses – most are simply classified as “slow learners” – or comprehensive, long-term developmental programmes, many of the OKU are deprived of any real chance for a better life. Another child, Natalia, 12, never received a conclusive diagnosis of her condition beyond being classified as a “slow learner” – although she is bright and expressive now. Her mother, Helen Laing, 35, who volunteers at the Long Laput rehabilitation centre, recalls that she’d first noticed her daughter’s odd behaviour when Natalia was three months old. Doctors in Miri said Natalia’s brain did not seem to have developed consistently with her age. Congenital rubella and delayed development were recorded in Natalia’s file, along with the note “requires further tests”. Given no explanation beyond that, “I kept feeling it was my fault somehow,” says Laing. “I felt so sad that Natalia’s future would be so limited, especially as life is already tough,” Laing adds, explaining that her husband is frequently away, working on offshore oil rigs. As for little Albee Boon Chai, three, who was born with a hole in her heart, doctors have identified her as “an extremely bright child”, and have recommended special education to give her the best chance to take advantage of her natural intelligence. “But both her parents are struggling to make ends meet in Miri. They can’t afford the luxury of putting her in special schools or hiring someone to look after her while they work,” says her grandmother, Tracy Anyi, who is in her 40s. These limited options for the young among the longhouse communities frustrate Lawai, who says that the communities are seeing an exodus to towns and cities, leaving some villages “dying” – over half of Sungai Dua’s estimated 1,000 residents are above 55. “It has been so many years and we have voiced our needs to the authorities countless times,” says Lawai. “We are still getting untreated rainwater. Why can’t the electricity lines be extended to our communities? Each home has to pay RM10 for a gallon of fuel to run generators each night if we want electricity. Various government efforts to provide financial assistance, such as the BR1M scheme (Bantuan Rakyat 1Malaysia, which entitles those with monthly incomes below RM3,000 to receive a one-off RM500 payment) or the e-Kasih programme (rural households that earn less than RM1,000 per month are eligible to apply for financial aid) are also not reaching the people who need it most. “How do you classify an OKU to apply for monthly allowances? Are the bedridden, the widowed or the elderly entitled?” asks Lawai. Telang Usan assemblyman Dennis Ngau Jok explains that miscommunication can happen; however, teams from the rehabilitation centre have frequently visited each village to explain about, and encourage, registration for social welfare schemes. “It is nonsensical for anyone to claim they are unaware of such availability of assistance,” he says. But who exactly is eligible for the schemes remains a grey area and hopes of a better future remain elusive, especially for those who are as marginalised as Sim Sun Hong. Malaysia is entering its 55th year of independence but it makes no difference to 53-year-old Sim, who has spent her entire life confined to a wheelchair inside her wood and attap house in Long Lama; she left it only once to visit the Miri Hospital. Sim was a premature baby vaguely diagnosed as having some sort of a “neurological disorder” at birth, according to her records. The disorder remains unidentified: though further tests had been recommended, her mother, Tiong Sai Yuk, now 70, says it had been such a harrowing trip to Miri that she could not take her daughter back to the hospital again. Only neighbours close by have seen Sim over the past 53 years. To the rest of the world, it’s as if she never existed. (KUALA LUMPUR, MALAYSIA) Jacob Dungau Sagan, Malaysian Deputy Minister of International Trade and Industry and Member of Parliament for Baram (Sarawak), has been caught red-handed in a timber corruption scandal that is likely to become a major embarrassment for the Malaysian government under Prime Minster Najib Razak. According to confidential documents published today by the whistleblower website, Sarawak Report, Jacob Dungau Sagan and his wife and daughter are the secret holders of three timber concessions in Sagan’s parliamentary constituency of Baram in the Malaysian state of Sarawak on Borneo. 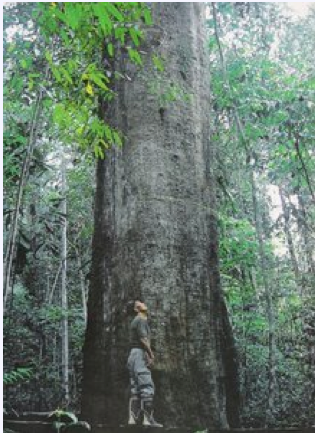 Sagan’s concessions, with an estimated worth of several million dollars, are specifically licensed to harvest Belian (Borneo ironwood), a particularly rare and sought-after South-East Asian tree species. Belian has been classified by IUCN, the International Union for the Conservation of Nature, as a vulnerable species and is banned for export from Sarawak and from Indonesia. Baram MP Jacob Dungau Sagan has recently come under fire for supporting the Barisan Nasional government’s controversial plans to construct a 1000 MW dam on the Baram river that would drown 26 villages in his constituency, including Jacob’s birthplace, Long Anap. It is estimated that the construction Baram dam would force the displacement of 20’000 indigenous people in Upper Baram but Malaysian officials are extremely secretive about the details of the dam plans. It is believed that the three Belian concessioins have been given to Jacob by Sarawak Chief Minister Abdul Taib Mahmud in order to buy his political support for the controversial Baram dam project. The corruption scandal hits the Malaysian government at an inconvenient moment, with a General Election expected to come up within months. Jacob Sagan is already the second Malaysian minister involved in a corruption scandal. For weeks, cabinet minister Shahrizat Abdul Jalil, who heads the Ministry of Women, Family and Community Development, has been in the headlines for mismanagement and the abuse of funds in Malaysia’s National Feedlot Corporation (NFC). The people of Baram have been sold down their own river by their native MP, the Federal Deputy Trade & Industry Minister Jacob Sagan! 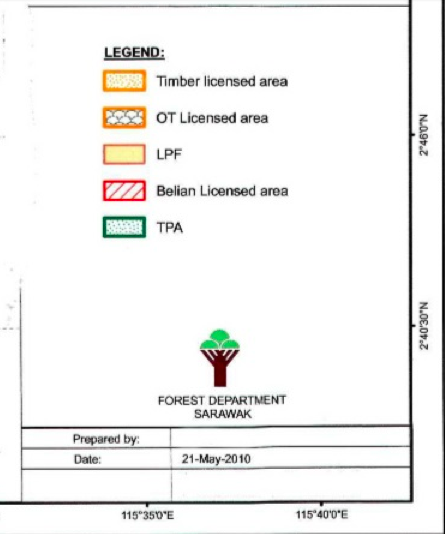 Sarawak Report has received exclusive information, indicating that the local man’s support for Taib’s plans to flood his own area has been bought by two large timber concessions, allowing him to log Belian wood! The shocking betrayal explains why Sagan, who is himself a Kenyah, born in Long Anap on the banks of the Baram River, is refusing to prevent Taib’s plans to build yet another dam in the region. The proposed Baram Dam would flood about 400 square kilometres of forest lands and displace around 20,000 indigenous people from Sagan’s own community, including his home village of Long Anap. Altogether, 26 Kenyah, Kayan and Penan villages will be drowned under water. Secret Belian concessions for Taib cronies! Precious hardwood forest. Belian Timber licences are only handed out to 'special people'! Local people have been at a loss to understand Sagan’s support for the project, which would destroy one of Borneo’s most precious remaining rainforest regions and the livelihoods of its people. There is no further need for electricity in Sarawak, so the dam has been condemned as unnecessary. However, secret Forestry Department Maps have now been made available to Sarawak Report, which give one very persuasive reason. The maps show that Sagan has been handed two hugely valuable Belian timber concessions right within his own region! 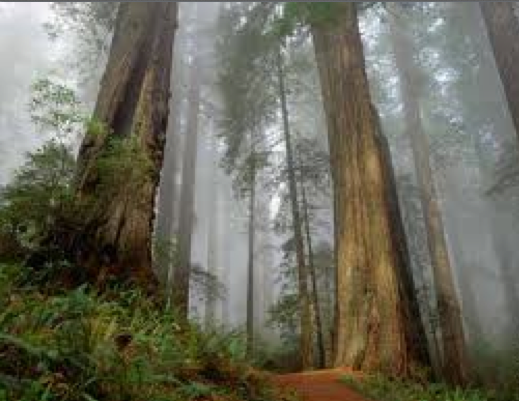 Standard timber concessions rarely include Belian, which is an endangered species and extremely valuable. Under normal licences the loggers are supposed to leave such special conservation species standing and it is subject to a total export ban. However, rumours have persisted that special concessions for Belian timber have been given out to Taib’s political cronies to buy their support. 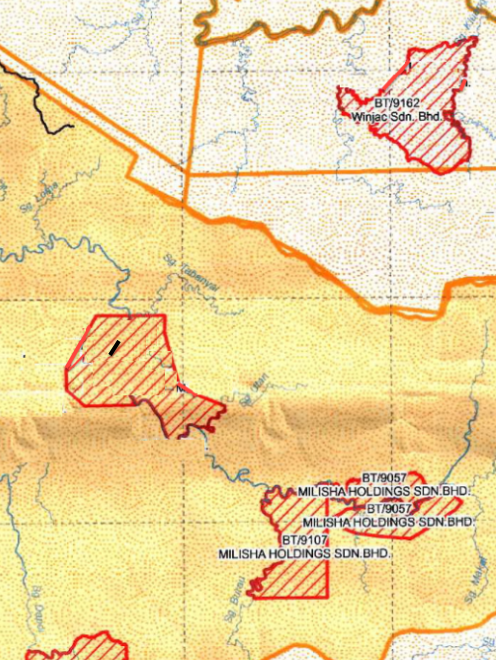 Our maps show that there is indeed a network of these Belian concessions in the Baram area, which still has stretches of virgin forest and it names the companies and the licence numbers. Two of these concessions are placed right in the middle of Jacob Sagan’s own Baram constituency area and cover an impressive area amounting to some 15 square kilometres. The companies owning the concessions are named Winjac Sdn Bhd and Milisha Holdings Sdn Bh. Wider maps show that these two concessions are situated right in the middle of the Baram region, near the Indonesian border and not far from Jacob Sagan’s birthplace of Long Anap. While, Sagan has travelled far and enjoyed a good life, thanks to becoming an ultra-loyal supporter of Taib, most of his relatives still live in this area. The value of these concessions run into millions of ringgit, according to experts in the business. Belian is an endangered species and takes hundreds of years to grow into the mature ‘iron wood’ , for which it is famous. Belian leaf - surely the wealth of the forests should be conserved and shared? The wood can sell at up to RM6,000 a ton, which is a sign of its growing scarcity, caused by the greed of the timber companies who have invaded Sarawak’s forests. So, who is getting these favoured concessions worth such wealth and what are they paying for them? Indeed, under normal uncorrupted practices Belian would be banned from being logged altogether, just as it is supposedly banned from being exported. Also, under normal uncorrupted practices, any licence that was given out would be tendered, so that the licence would go to the highest bidder and the money for the licence could then be used by the government to improve the lives of local people. Timber licence money would be one way to pay for schools, roads, electricity, water pumps and better health care and allowances. However, the people of Baram remain poor and with few such services. So, who has these concessions and what did they pay? 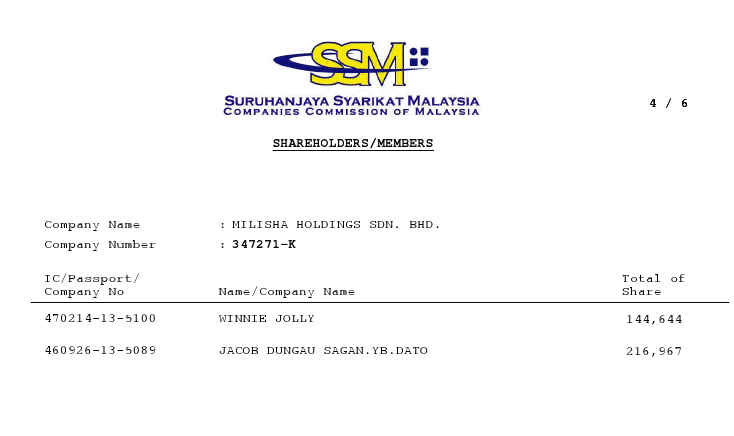 Milisha Holdings Sdn Bhd is jointly owned by Jacob Sagan himself and his wife, Winnie Jolly! 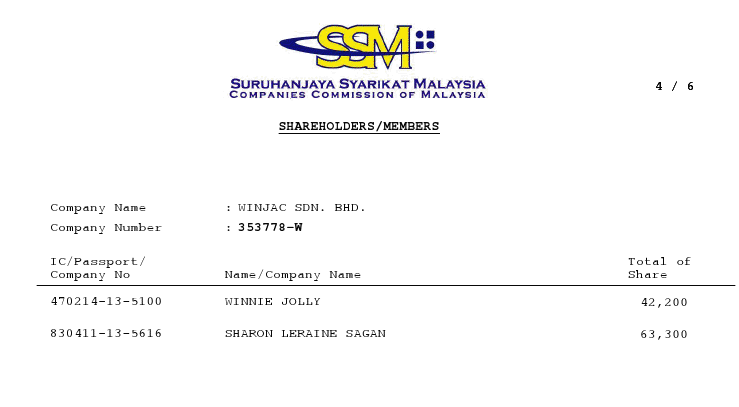 It turns out the shareholders of the company Milisha Holdings Sdn Bhd are none other than local MP and Government Minister, Jacob Sagan and his wife Winnie Jolly! Did Jacob Sagan tell his voters? This demands an explanation from Taib Mahmud and Jacob Sagan, preferably to the forces of law and order. Because, to secretly hand an MP of your own political party a large and valuable timber concession is a scandalous conflict of interest. People in public office should not get involved in any form of business involving state concessions, for obvious reasons, and any business interests should be openly declared. But, there is no evidence that Sagan has publicly declared this timber licence BT/9107, granted to his company Milisha Holdings. Nor is there any evidence that he has declared licence BT/1962, which he also holds through his wife and daughter’s ownership of Winjac Sdn Bhd. Perhaps we will learn how many of Jacob Sagan’s constituents were aware that Jacob Sagan has been handed two Belian concessions worth millions of ringgit, thanks to Taib’s Planning and Resources Ministry. With what did Sagan pay for this concession? Next, it is important to discover how much did Jacob Sagan pay for this secretive concession that has been granted to him in the land belonging to his own voters by the BN government of Taib Mahmud? Such a valuable concession, worth millions of ringgit, should have cost a very great deal in premium payments to the statute. However, on his salary as an MP of RM12,000 a month how could he afford this? 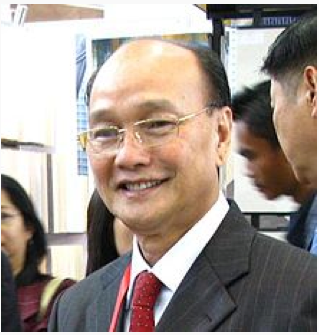 His previous career as a Sarawak civil servant could not legitimately have made him a rich man either! At the moment, because Taib keeps all his timber negotiations a scandalous secret, we have no information about how much Sagan paid, if anything. We are left with the inevitable conclusion that Sagan has paid for these concessions with the one thing that he has that is of value to Taib Mahmud, which is his political support. 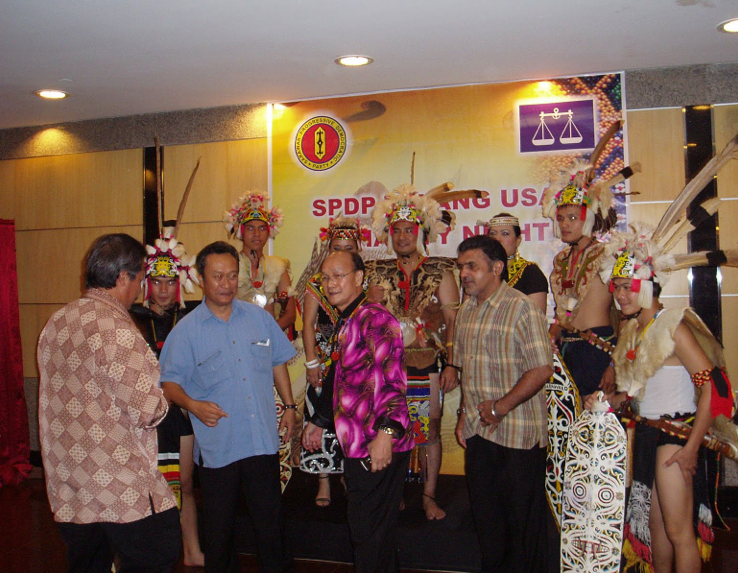 Will any of Sarawak's trees be allowed to stay standing, as BN's MPs set about plundering what is left of the state? So, if Taib has decided that he can make himself wealthier by flooding the people of Baram and using the electricity to power factories owned by himself, then BN MPs like Jacob Sagan have no choice but to support him. It is plain that Jacob Sagan’s loyalty has been bought by Belian. Because he has been bought by Belian, Jacob Sagan can no longer fight for what is right for his people. So, even if Taib decides to flood their lands, destroy their livings and move all his relatives to resettlement towns with minimal compensation, Jacob Sagan has to keep supporting Taib. If not, Jacob and his wife and family would lose their Belian concessions and have to live on their actual income of RM12,000 a month. That might sound a very good salary for most people, but BN MPs have got used to living like kings, because they have sold their duty towards their people in return for licences to plunder them. KL housing scheme: Birth of subprime crisis? Who are the NFC scandal whistleblowers? Golf At The Sarawak Club – Serious Foul Play! Why is the government raiding our piggy bank?